The Census Bureau has launched a pretty new website for Census 2010. My fave page is the interactive sample form. More information below. Check it out, spread the word, and be counted! The Census Bureau is working hard to reach every person living in America to inform them and their communities about the importance of the 2010 Census. As part of this larger integrated communications effort, today we launched a new website,2010census.gov. A Spanish language site will launch in November. This website is the platform on which we will build a national dialogue about how each person’s participation helps paint a new “Portrait of America.” Share this site with your family, friends and neighbors to spread the word about why the 2010 Census matters. The census is now in your hands. In the marquee, hear real people from all walks of life and from communities across America express their questions about the Census and get the real answers. In the Whole Story, learn the truth behind census myths. In Top Questions, easily find answers to even more questions. “How It Works” explains the census and walks you through the 10 questions on the form that you will receive next spring. Information on key census dates is just a click away. The multimedia center (videos, photos and audio) shares with you peoples' stories about how the census is easy, safe, and important. Why is the OECD your new BFF? Because the publishing arm of the Organisation for Economic Co-operation and Development is the most savvy and user-oriented data publisher around (beyond of course my other BFF SimplyMap). What has the OECD done to deserve my love? The OECD Factbook 2009 is now available as an iPhone and iTouch app. That's right dataheads, you can take your economic indicators out on the road with you. 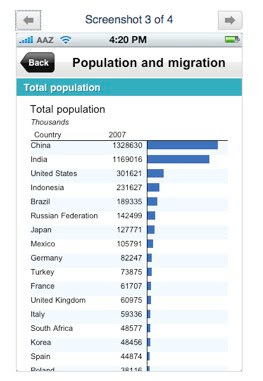 Below is a screenshot of the Total Population for the 30 OECD countries and OECD cooperation countries (Brazil, Russia, etc). While the bar charts aren't visually interesting, it is still pretty nifty to have major indicators from 30 countries at your fingertips (Potentially useful for my bar trivia addicts). I would love to see a more interactive version at some point (e.g., be able to choose specific countries to display and compare). Nevertheless, this e-reference book is a great start. Thanks OECD! Need a visual display of the Gross Domestic Product for a few countries? IMF to the rescue! 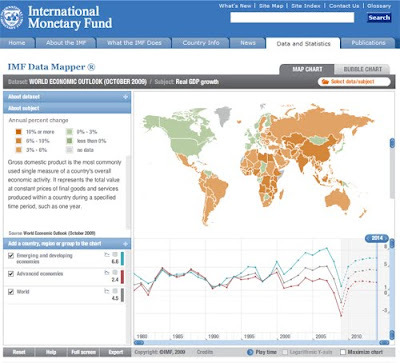 The IMF Data Mapper lets you visualize data from some of the IMF’s major sources, including World Economic Outlook, Balance of Payment Statistics, Government Finance Statistics, AFR Regional Economic Outlook, and Joint IMF-OECD Statistics. You can choose from around 80 different indicators, such as GDP, inflation rate or unemployment rate. You can display data for specific countries, regions, or analytical groups, such as the Euro area or emerging and developing economies. The Australian government is getting into the act of making public information datasets available online through data.australia.gov.au. The portal provides access to a variety of government datasets with most concentrated in environmental, community, geographic and transportation areas at the moment. My favorite is a shapefile of all Austrialian World Heritage properties! Many of the datasets have Creative Commons licenses, so feel free to have fun with them. In fact, the Government 2.0 Taskforce is encouraging Australian users to enter the Mashup Australia Competition. Submit your mashups between October 7th and November 6th. The US version, Data.gov, should take a cue from the Australians and have a mashup competition!